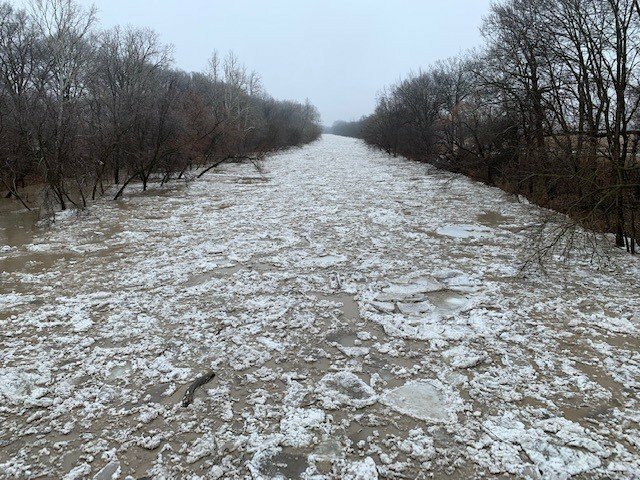 Flood Warning (update) – February 7, 2019 – 5:15 p.m.
• The ice jam at Prairie Siding has begun to move. • Water levels have started to drop in the city of Chatham but may not continue to do so if the ice jam reforms further downstream. Last night an ice jam formed downstream of the city of Chatham around Prairie Siding. It caused water levels in the city to rise rapidly through the night and have continued to rise all day. Reports have come in that the ice jam has now started to move. Flooding will still continue in a number of low lying areas within the city of Chatham. Citizens should be cautious as the ice jam may reform further downstream. There could still be additional impacts along the downstream portions of the river through the Raleigh and Dover areas and into the town of Lakeshore including Lighthouse Cove. Residents should pay close attention to local conditions and be prepared should water levels exceed the flood protections. The LTVCA continues to operating the 6th Street Dam and Pumping Station. This should protect the south end of the city of Chatham on McGregor Creek from flooding. However, residents in the south end of the city of Chatham should also pay attention to local conditions. A system of thunderstorms is moving through the area, mostly south of us. As water levels are high, excessive rainfall could lead to localized flooding upstream in the areas along McGregor and Indian Creek currently protected by the 6th Street Dam.